Roberta McCain, mother of John McCain, pays respects before his flag-draped casket Friday at the Capitol rotunda. His final public memorial was Saturday at the National Cathedral. 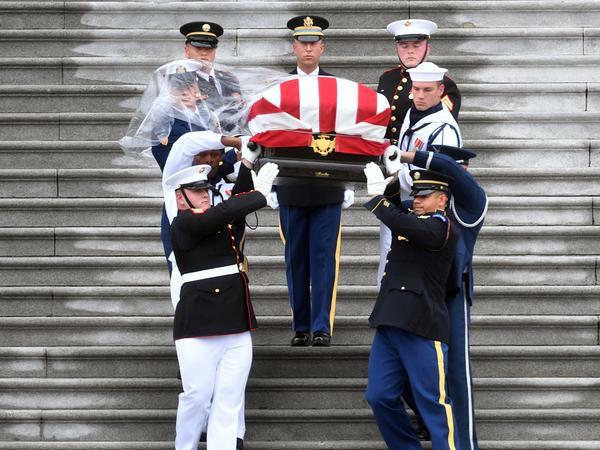 The casket of Sen. John McCain, R-Ariz., is carried down the steps of the U.S. Capitol in Washington on Saturday. The motorcade carrying the flag-draped casket paused at the Vietnam Veterans Memorial on its way to the National Cathedral. 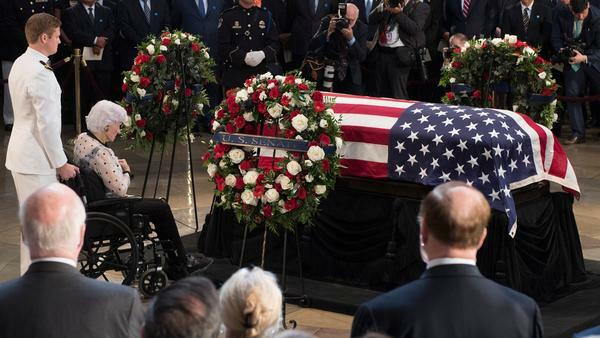 The carefully choreographed service at the Washington National Cathedral was the culmination of a week of public memorials for the Arizona lawmaker, who died Aug. 25 at age 81. McCain is to be buried Sunday in a private ceremony at the U.S. Naval Academy Cemetery. Former Presidents Barack Obama and George W. Bush — who both competed against McCain in battles for the White House — were among those offering tributes. "What better way to get a last laugh than to make George and I say nice things about him to a national audience," Obama joked, adding it was a symbol of McCain's large spirit that while he relished political combat, he could also find common ground with former rivals. McCain understood that "some principles transcend politics. That some values transcend party," Obama said. "We never doubted that we were on the same team." He recalled the moment from the 2008 campaign — replayed often on television this week — when McCain challenged one of his own supporters who had falsely claimed that Obama was not an American. "I was grateful, but I wasn't surprised," Obama said. "He saw himself as defending America's character, not just mine, for he considered it the imperative of every citizen who loves this country to treat all people fairly." Bush also described tangling with McCain, who had been tortured as a POW in Vietnam and fiercely opposed harsh interrogation tactics employed by the U.S. in the years following the Sept. 11 attacks. "Back in the day, he could frustrate me, and I know he'd say the same thing about me. But he also made me better," Bush said. "To the face of those in authority, John would insist, 'We are better than this. America is better than this.' "
"He could not abide bigots and swaggering despots," Bush said. "There was something deep inside him that made him stand up for the little guy – to speak for forgotten people in forgotten places." McCain's daughter Meghan delivered an emotional tribute that was both affectionate toward her father and an implicit rebuke of President Trump, who was not invited to the service. 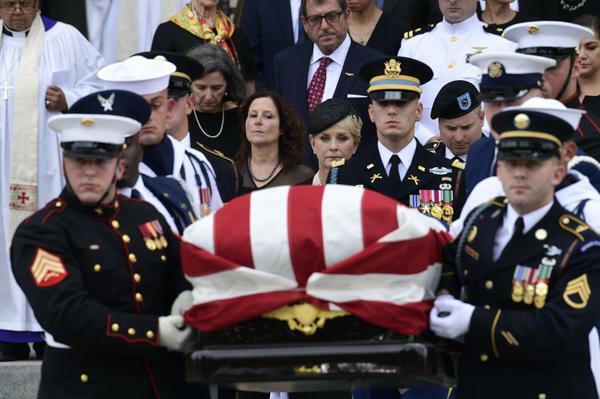 "We gather here to mourn the passing of American greatness — the real thing, not cheap rhetoric from men who will never come near the sacrifice he gave so willingly," Meghan McCain said. She later appeared to take a swipe at Trump's presidential campaign slogan: "Make America Great Again." "The America of John McCain is generous and welcoming and bold," she said. "The America of John McCain has no need to be made great again because America was always great." For all of John McCain's exalted titles — war hero, senator, presidential nominee — Meghan McCain said she loved him best as a father. "Imagine the dashing aviator, who took his aircraft hurtling off pitching decks in the South China seas, kissing the hurt when I fell and skinned my knee," she said. "John McCain was not defined by prison, by the Navy, by the Senate, by the Republican Party or by any single one of the deeds in his absolutely extraordinary life. John McCain was defined by love." "The greater cause to which he devoted his life was America," said former Connecticut Sen. Joe Lieberman, the Democrat-turned-independent who came close to being McCain's running mate in 2008. "Not so much the country defined by its borders, but the America of our founding values: freedom, human rights, opportunity, democracy and equal justice under law," Lieberman said. "Remarkably, his death seems to have reminded the American people that these values are what makes us a great nation — not the tribal partisanship and personal attack politics that have recently characterized our life." The motorcade carrying McCain's flag-draped casket paused at the Vietnam Veterans Memorial on its way to the cathedral, and his widow, Cindy McCain, placed a ceremonial wreath there. McCain, a naval aviator, was shot down during the Vietnam War and spent 5 1/2 years as a prisoner of war.